Visit the ‘Packages’ section to view 2019 packages and inclusions, or if you know what you’re after simply select ‘Buy Now’ against a package and follow the prompts to join online. You can add your item(s) to your cart, confirm your (or the recipients) details, select seats (if applicable) and submit your payment details through our secure payment gateway. 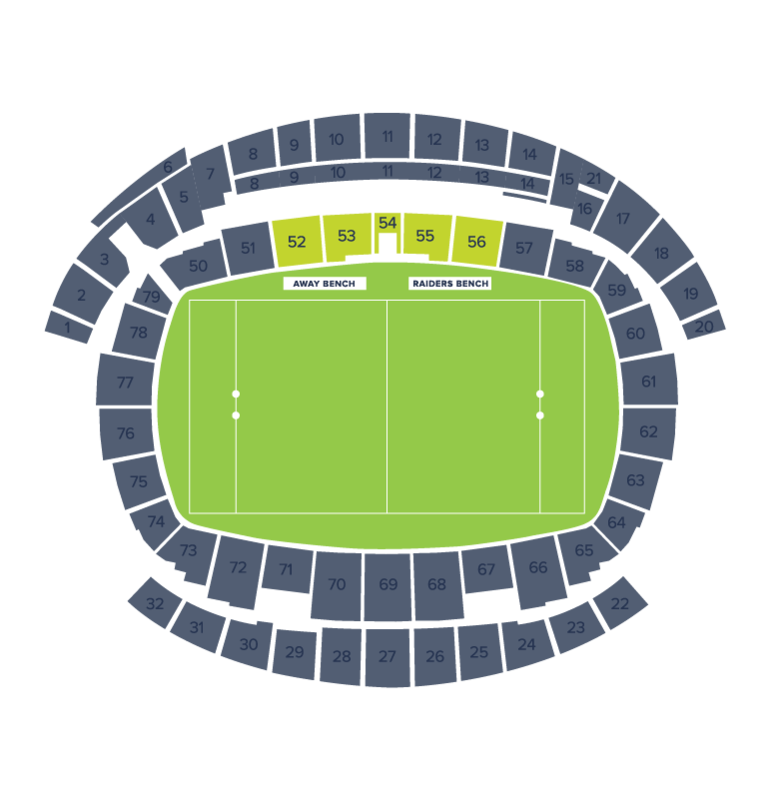 If you’re viewing the interactive seat map to select seats, using a desktop computer with Google Chrome or Mozilla Firefox is recommended. All individual members and family head’s, if part of a family membership, will be sent a renewal letter during the renewal period and will be emailed, with instructions on how to renew for 2019, including how to login to their new MyAccount. For members wishing to renew their same seats, the same seat cut-off closes 31st October 2018. 2018 Members on the Rolling Renewal Plan will have deductions commence from the 11th/12th September 2018 respectively. You can choose either to pay upfront or by monthly installments. Please refer to ‘Payment Options’ below for further details. Delivery of all member packs will commence from the end of November 2018, after the seat change window has concluded for reserved seat members. Packs will be sent to the address listed on the individual account or family head’s account if part of a family membership. Membership packs are sent through Australia Post from our supplier in Melbourne. And can take upto 21 working days for delivery. We encourage all members to join by the end of November if wanting to receive member packs in time for Christmas to avoid Christmas delivery delays. Delays will be expected with membership purchases between December and January. If you are unable to attend a Raiders home game at GIO Stadium, we encourage you to forward your membership to a friend or relative to use. Please see our print-at-home ticket information for assistance. Please note, entry to the stadium is subject to the classification of the membership (e.g. an Adult cannot enter on a Junior membership). To arrange an upgrade for junior and concession memberships, present your junior or concession membership to the Box Office on game day. A small upgrade fee will apply. 2018 Members on the Rolling Renewal Plan will have payments commence from the 11th/12th September 2018 respectively. For members wishing to renew their same seats, the same seat cut-off closes 31 October 2018. To keep your seat, some form of payment either in-full/upfront or initial installment if paying via installments must be received by this date. After this date, any seats previously belonging to 2018 members who have not renewed will automatically be made available for allocation to upgrading and/or new members. What if I’m looking to change seats for 2019? Renewing members looking to change seats are encouraged to renew before the same seat cut-off closes on 31 October 2018. This will ensure their seats from 2018 are secured, in the event preferred alternate seating is unavailable. A seat change window will open early November after the same seat cut-off has closed, and all members looking to change seats will have an opportunity to do so during this period. Members will be notified via email and provided instructions on how to select alternate seating themselves online. If a member changes their seating during the seat change window their 2018 seats will no longer be available to them. If a member does not select alternate seats during the seat change window they will retain their 2018 seats for the 2019 season. Additional assistance will be available from the Membership Team should you experience any difficulties during this period. How will I know if I have successfully renewed my membership? Members will receive a confirmation via email, if an email address is supplied, to confirm the receipt of their renewal. If you do not supply an email address the only way to confirm your renewal has been received is to contact the Membership Team. Yes, it’s is the perfect gift for any Raiders fan! Before you sign them up, please take note of the following to ensure the process is a smooth one for you. Ensure that you register the membership under the recipient’s name. An automatic confirmation email is sent to the registered email address once the application is received. If you do not wish for the recipient to receive any communication until the present is received, please ensure you register an alternate email address and contact number until they’re received their gift. After this time, you or the recipient can contact us to update their details. If you require a gift certificate, please contact the Membership Team with the name(s) of the members requiring a gift certificate and your address. If you sign up online using a desktop computer you will be able to view the interactive seat map to select your own seats. If using a smartphone you will receive a selection of seats to choose from that match your criteria. 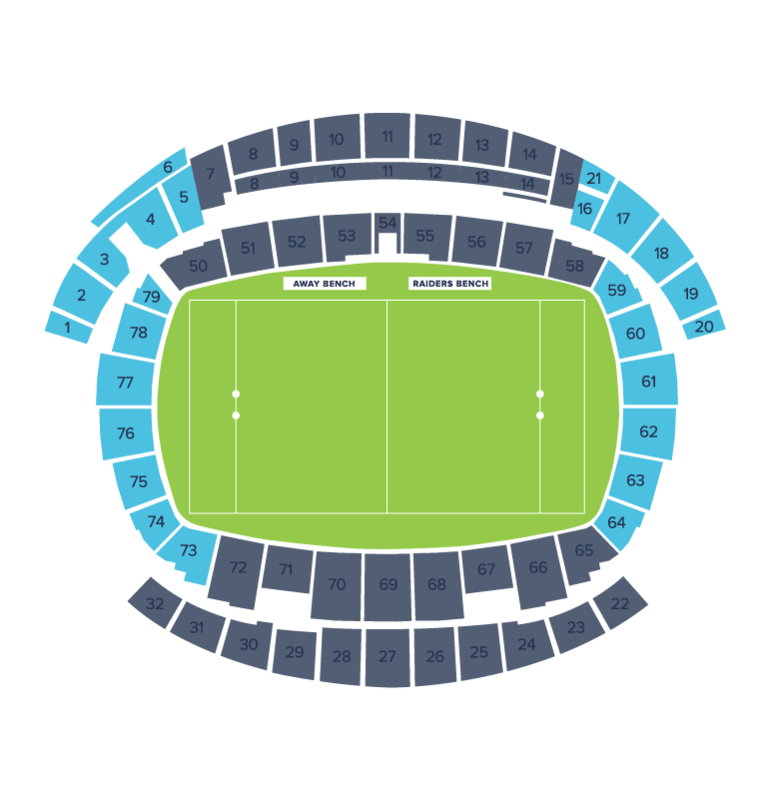 If you join by returning an application form to Raiders HQ or sign up in person you will be allocated the best available seats based on the seating preferences provided. Can I sit with friends who are also applying for membership? If you have a general admission membership, you can sit in any seat in the general admission area upon arrival to the game, making it easy to sit with friends and family on game day. If you wish to sit in reserved seats with members who are part of a separate order it is recommended you contact the Membership Team to discuss and confirm your seat request. If you do not supply an email address the only way to confirm your renewal has been received is to call the Membership Team. Rolling renewals take the hassle out of renewing your membership. All members who pay via credit card (VISA, Mastercard or American Express) online, either upfront or via monthly instalments, will be opted in for rolling renewals. Prior to the rollover, members will receive written notice via email that details the pricing for the following season. Members can choose to opt-out during this 14-day opt-out period before payment is taken or at any time during the season by contacting the Membership Team. Members can pay for their membership upfront. If you choose to pay upfront, payment will be taken upon receipt of your application/renewal. All members who pay via credit (VISA, Mastercard or American Express) online will be opted in for rolling renewals. Refer to ‘What are rolling renewals?’ for details. Cheques and money orders must be made payable to ‘Canberra Raiders Pty Ltd’. All members paying by this method must write their full name and phone number on the back of the cheque/money order and staple to the application/renewal form. Cash and EFTPOS payments must be made in person at Raiders HQ, 2 Eade Street Bruce, Canberra between the hours of 09.00am – 5.00 pm Monday-Friday (excluding Public Holidays) or at events at the time the form is submitted. Please do not post cash in the mail. Members with access to all home games at GIO Stadium, as part of their membership are able to pay via instalments. There are no set-up fees to pay via instalments, but failed payments may incur late payment fees. Instalments will commence on 11 September 2018 and a maximum of ten monthly instalments (paid on the 2nd Tuesday of each month) will apply to ensure all memberships are paid in full and finalised by 11 June 2018. All members who join before 12 September 2018 will pay the amount equal to the first instalment at the time of sign up. All members who join after 12 September 2018, will have the number of required payments deducted immediately upon receipt of application/renewal to bring them up-to-date with the fixed schedule. Subsequent monthly instalments will then be taken at each specified date. If any future payment fails, further attempts will be made throughout the month to clear the funds until successfully processed. Members will not be provided with reminders or invoices prior to each instalment. Members are able to make additional payments by logging into their account. Members who pay part of their remaining balance ahead of time will not have another payment taken until they owe money again, according to their instalment schedule. I’m on the Rolling Renewal Plan, how do I update my contact or payment details? Please contact Raiders HQ direct on 1300 4 RAIDERS (1300 472 473). Payment details can be updated online through Your Account, however email notification to Raiders Membership is required as well. Juniors must be 16 years of age or under as of 1st March 2019. Name of junior and date of birth are compulsory for all junior memberships. Children 0 – 4 years may enter Raiders home games at GIO Stadium, for free, but must be seated on the lap of an accompanying adult. Children 5 years and over must have their own ticket. If you have a Full time Student Card, Seniors Card or Pensioners Card you are eligible for a concession membership. Appropriate proof of concession must be available for display on ground entry. When you see ‘Family 1A + 1J’ or ‘Family 2A + 2J’ this represents a family membership. Family memberships must be purchased in multiples of one adult and one junior i.e. one adult and one junior, two adults and two juniors etc. The family head is the person who has the Family 1A membership in their name. Companion card holders are eligible for complimentary entry to Raiders home games at GIO Stadium, however are ineligible for member benefits unless paying as a member. A valid Companion card must be presented at the time of purchase. If you are a companion card holder or require special needs and/or wheelchair seating please contact the Membership Team for assistance. How do I use my Bronze 2, 4 or 6 Game membership? If you have a Bronze 2, 4 or 6 Game membership your membership allows you to attend any 2, 4 or 6 regular season Raiders home games at GIO Stadium. There is no need to notify us when you are attending. Simply scan the barcode on the back of your members card at the turnstile when you arrive at GIO Stadium Canberra, then head to the general admission area to find a seat. You can sit in any available seat within this area. The earlier you arrive, the more seating options you will have. Please note, each Bronze 2, 4 or 6 game membership only allows access for one person, per game, per memebrship at GIO Stadium. How do I get to and from Raiders home games at GIO Stadium? GIO Stadium Canberra is located on Battye Street in Bruce, ACT. Taxis are permitted to drop-off patrons using Battye Street on the West side only. Drop-off location is approximately 75 metres from the Western gates. Taxis are available on conclusion of the match from the West side only, in front of the AIS Arena. Public car parking is available at a number of locations around the GIO Stadium precinct. Parking is managed by GIO Stadium and car park attendants are present to assist in guiding cars into car spaces. Members are responsible for the security of their own vehicles and are reminded not to leave valuables in their cars. Car parking costs for 2019 are $10 per game. Patrons are reminded to park legally at Raiders matches and Video Message Board’s (VMB’s) will be in place from time-to-time saying “delays expected” and “park legally”. Territory Venue and Events (and their appointed contractors) are responsible for the venue Traffic Management Plan and GIO Stadium’s website has parking information and maps to assist patrons to park in controlled car parks. Can I still access the venue if I leave my card/ticket at home? Yes, absolutely. You will need to queue at the Raiders Membership & Corporate enquiries window adjacent to the Box Office at the stadium (on game day) with photo identification, and request that a replacement ticket is issued for your seat(s). This process only applies at Raiders home games at GIO Stadium, prior to kick off of the NRL Premiership game. How do I replace my members card if it’s lost or stolen? If you’ve lost your members card or it’s been stolen, please contact the Membership Team to arrange a replacement card. The barcode of the original card will be cancelled and a fee of $15 will apply for the replacement of each lost card. The Members Lounge is an area offered exclusively to Raiders Members. 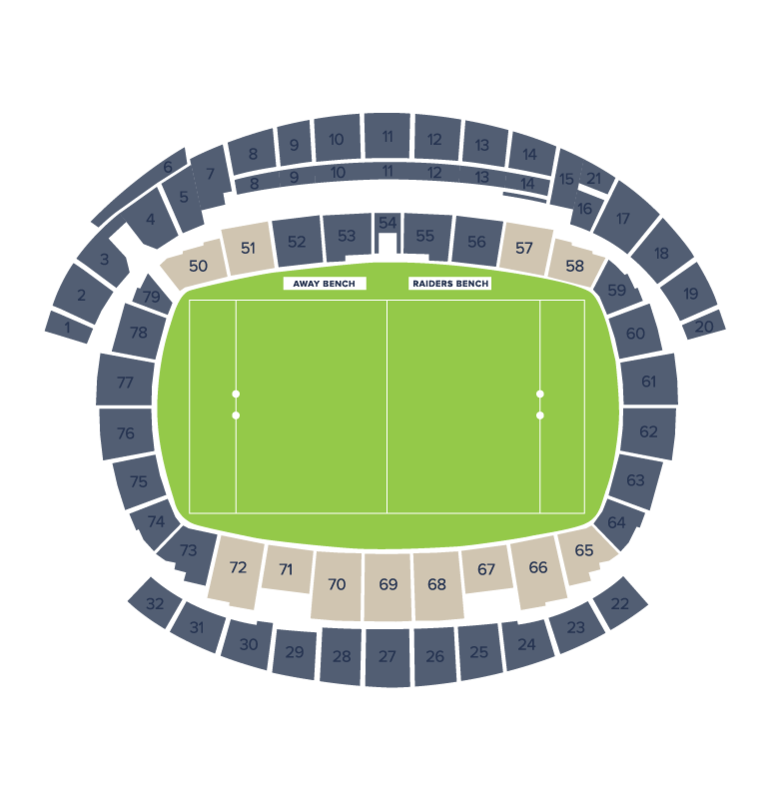 Members can access the Lounge, located in the Mal Meninga grandstand or the Gregan-Larkham stand, by presenting their members card upon entry. In the air conditioned/heated Members Lounge you can access food and beverage outlets, listen to the pre-game interview, enter weekly prize draws, as well as listen to live music and partake in activities suitable for all ages at selected games. How do I purchase additional tickets for a Raiders home game at GIO Stadium? All additional tickets for the Raiders home games at GIO Stadium are sold through Ticketek. Membership is the cheapest option if you’re attending more than one Raiders home game at GIO Stadium. As a result, we do not offer tickets at a discounted rate. Encourage your friends and family to join as a Raiders member to ensure they too get the best value when attending Raiders home games at GIO Stadium. Who do I ask for assistance on game day? If you have a general membership enquiry before kick off visit us at the Membership marquee (West) or the Membership & Corporate enquiries window (East/West), next to the Box Office on arrival. Alternatively, you can speak with any official customer service, security or other staff member and they will be able to provide further assistance/direction. How do I access tickets to the NRL Finals Series and Grand Final? The NRL manages ticketing for the State of Origin, the Final Series and Grand Final. All members receive a priority window to access tickets to the State of Origin any Finals involving the Canberra Raiders, plus the 2018 NRL Telstra Premiership Grand Final before the general public. Further information regarding priority windows to access tickets will be provided as confirmed via email only. This information is not sent via post, so please ensure you always have an active email address registered and are regularly receiving member e-News. Where can I find my account ID (member number)? Your account ID (member number) can be found on the back of your membership card, or on your confirmation email if you have not yet received your membership card. What is the difference between reserved seating and general admission? If you have a reserved membership, you will have your own seat at all Raiders home games at GIO Stadium. 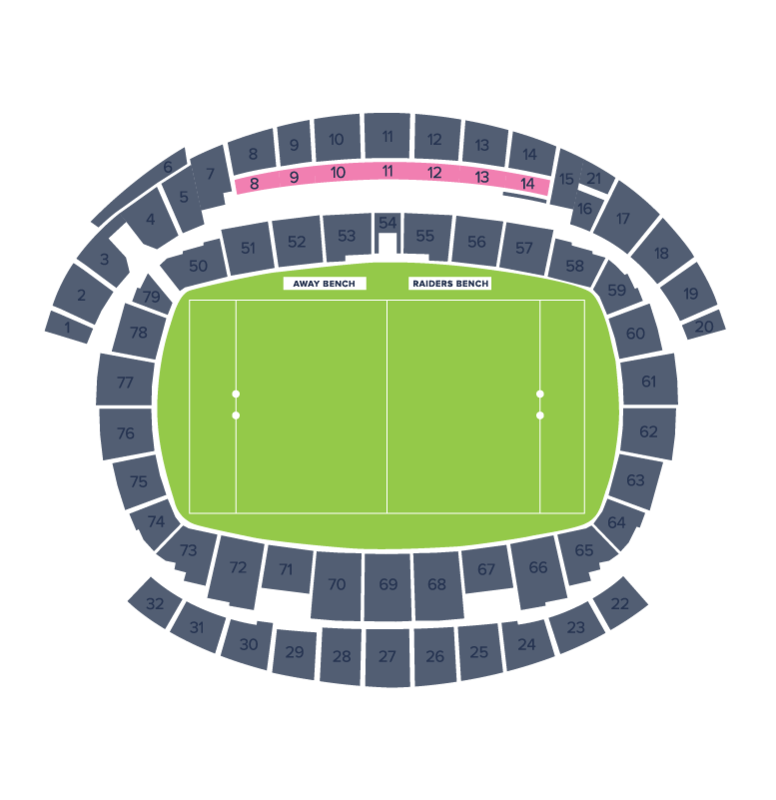 Reserved seating is available both in the inner bowl which is closest to the field or in the Gregan-Larkham (East) or Mal Meninga (West) grandstands. If you have a general admission membership, you can sit in any seat in the general admission area upon arrival to the game. The earlier you arrive, the more seating options you will have. How do I receive my Raiders Member merchandise discount? Alternatively show your 2019 Raiders membership card at Jersey’s megastore or the GIO Stadium game day merchandise outlet, to receive your benefit. How can I get my Raiders merchandise and memorabilia signed by a player? Throughout the 2019 season, there will be opportunities to meet the players and have you merchandise and memorabilia signed. Read your member news for information and updates. What is your donation and appearance policy? For information regarding donations and appearance requests please click here for details.